A young lady in my Church choir wants to join and play guitar. My mother, the director's assistant, promised to get her a strap so she could participate. ...but her guitar is a purely acoustic one, with no strap buttons. I remembered that straps for such guitars exist, but hadn't seen one in about 10 years, so I had some shopping to do. I went to my FLMS (see my sig) but they had nothing. GC was also a bust, and they told me no such thing existed. I went to Music Go Round and found the Neotech Slimline Classical Strap. WINNER! I thought I'd share this, just in case anyone else was trying to solve the same problem. I'd also welcome anyone to post additional links in case they know of similar or superior products. The link is broken, unfortunately. The question I'm asking is this though: Why not just put strap buttons on it? When I got my acoustic, I had the same issue. 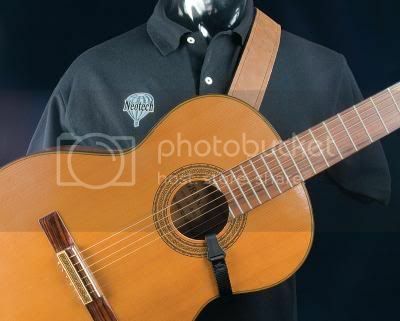 But when I asked about buttonless straps at my guitar shop, they simply offered to put buttons on it to make the entire thing easy. The tone wasn't affected in any way I could notice, and it didn't harm the guitar at all. By the time they were done it looked natural, like the buttons had always been there. Actually, the root site works. Just go to neotechstraps.com. And I suppose you're right putting buttons onto a classical guitar isn't really a good idea. Either way, awesome job digging that strap up! The young lady in question couldn't afford to have her guitar altered, nor could she afford to replace the guitar if the tone were adversely affected. This strap, being non-invasive, was an ideal solution.